The Persian name of the above dish is “shevid baghali polow” with “goosht” 🙂 It is considered a festive dish, with so many variations in different Iranian cities. My culinary adventure in this case includes preparing the meat component of the dish in “pot roast” style. I strongly recommend it over the more traditional way of “cooking’ the meat in water. Veal (or beef) boneless chunks appropriate for roast (loin, or fillet), 500-600 grams, washed and patted dry. Carrot, 1 medium, thickly sliced lengthwise. onions, 2 medium, thickly sliced lengthwise. 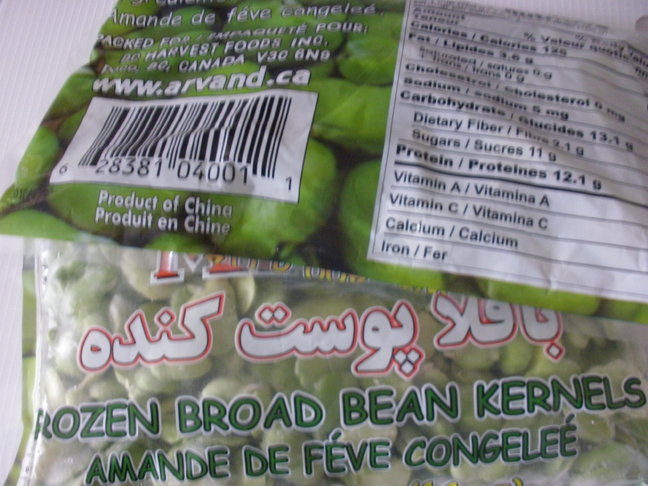 Turmeric and Iranian all spice (advieh) for mixed rice, ½ tbsp. each. Method: In a medium size thick-bottomed pot, heat oil. Rob salt, pepper, and advieh all over meat’s chunks and brown each side for a few minutes over medium heat. Transfer the roasts into a platter. Add onions and garlic to the pan and cook for two minutes, then add carrots on the top. Sit the roast on top of onions and carrot. Turn the heat to minimum, cover with a tight lid and slow cook for at least two hours. You will not need to add any water at all! 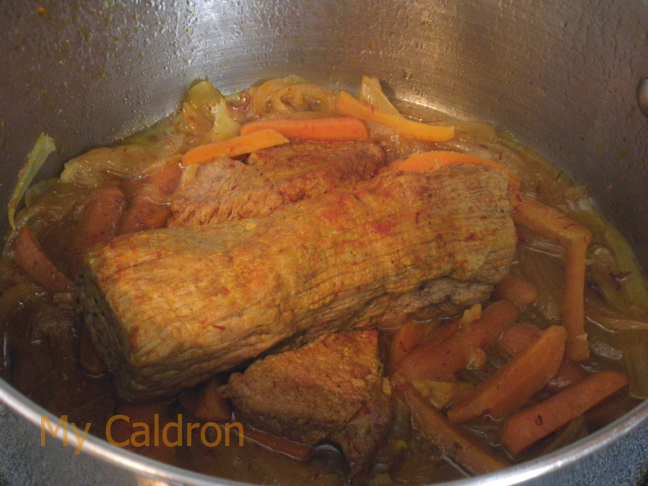 The roast will release its liquid and cooks itself at the core in the water produced by onions and carrots. You will see that at the end of cooking process (two hours or so) you will get a thick tasty broth and an extremely tender and savory roast meat. Fresh dill, washed and chopped, ½ cup + 2 tbsp. dried dill. Salt, oil, water, as needed. 1) At the stage when you add your soaked and drained rice to the boiling water, add a pinch of turmeric. 2) Just before you judge the grains to have been cooked at the core and ready to go to the colander, add the board beans as well. They should not cook in the water more than a couple of minutes though or will go mushy. 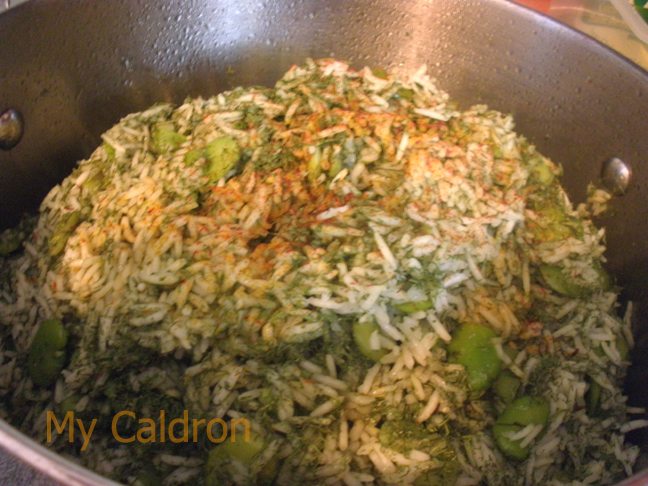 Drain rice (now mixed with broad beans) in a fine meshed colander. Do so a bit earlier than you normally would. Once in colander, add the dried and fresh dill and shake the colander hard a few times (do not stir). 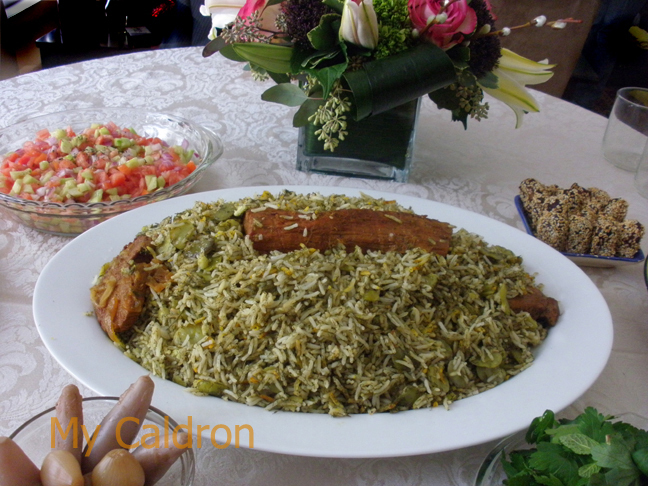 Prepare the pot’s bottom with oil and bread or rice for tahdig, mound the mixture of rice, dill, beans back to the pot. Sprinkle a pinch of saffron and 2 tbsp. 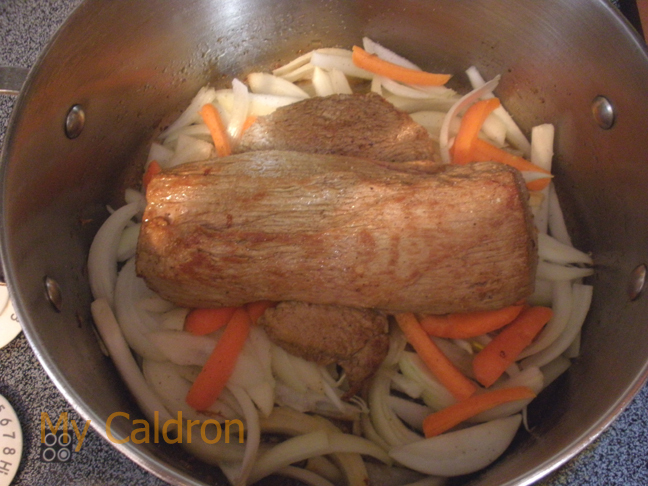 of broth (from your pot roast) and cover the pot with the lid. When you notice steams building inside the pot, wrap the lid in a clean kitchen cloth and put it back on. Allow at least one hour for the mixed polow to steam cook.